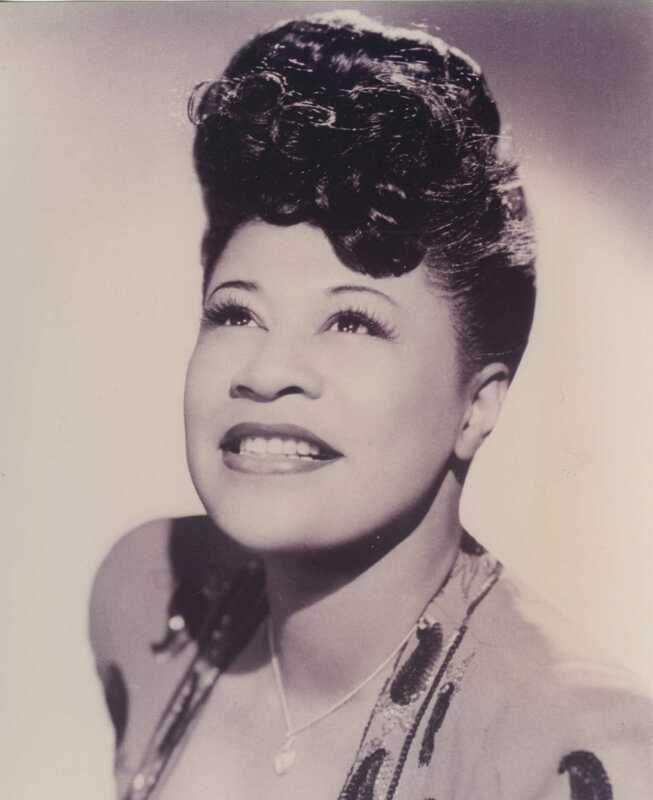 The Ella Fitzgerald Charitable Foundation visited the Museum for a tour on Wednesday and graciously donated priceless artifacts from Ella’s archives to our collection— items including sheet music, concert programs, and music albums. 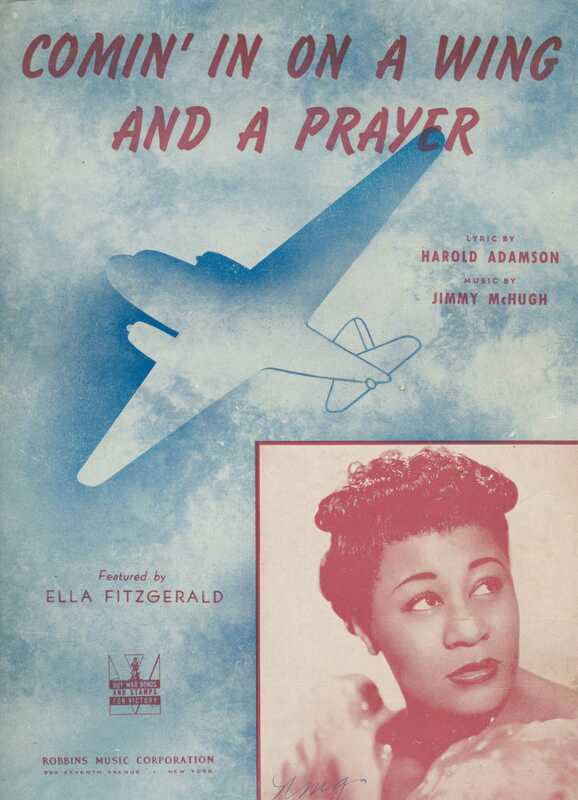 For example, pictured below is a piece of sheet music from Ella’s collection for the popular wartime song “Comin’ in on a Wing and a Prayer” (an audience favorite for the Victory Belles in their recent “Songs that Won the War” revue). The Foundation made an additional contribution that will help fund school Title 1 field trips to the Museum. 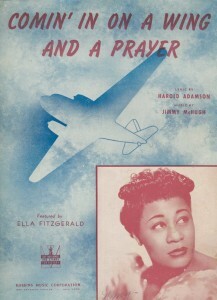 WWII-era sheet music donated in memory of Miss Ella Fitzgerald from the Estate of Ella Fitzgerald. While on campus, the group visited an item related to Fitzgerald, “First Lady of Song,” displayed in BB’s Stage Door Canteen, the Museum’s tribute to wartime USO entertainment venues. 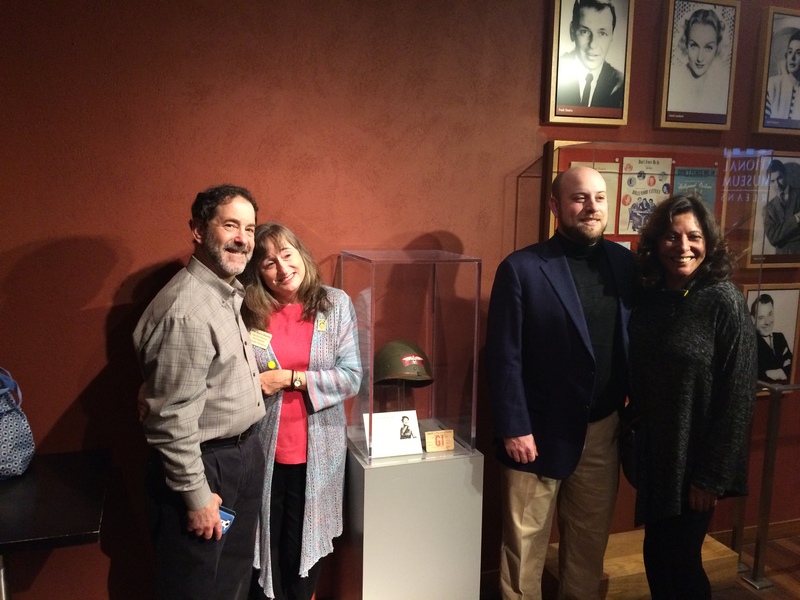 Pictured at the M-1 helmet liner, worn by Fitzgerald at a USO camp show, are (left to right), Richard Rosman, Fran Morris Rosman, Randal Rosman, and Irene Romero. Pictured at the M-1 helmet liner, worn by Fitzgerald at a USO camp show, are (left to right), Richard Rosman, Fran Morris Rosman, Randal Rosman, and Irene Romero. M-1helmet worn by Ella Fitzgerald on display in BB’s Stage Door Canteen at The National WWII Museum. Thanks for visiting, foundation friends, and thanks for your generous support! Check out the foundation’s Facebook page for more information. In 2018, as The National WWII Museum seeks to continue our immersive journey through all stories of World War II, the Museum will open the doors of the exceptional Liberation Pavilion. The pavilion will include three building levels that will span the closing months of the war and immediate postwar years, concluding with an explanation of links to our lives today. The first floor, Liberation, will provide visitors with opportunities to contemplate the joys, costs, and meaning of liberation and freedom. The second level, Victory, recalls the celebrations that followed the war’s end and the transition from war to peace. The third floor, Fruits of Victory, focuses on the present, drawing connections between World War II and its profound meaning for our world today. One of the most significant features of the upcoming Liberation Pavilion will be the Liberation Theater, made possible through a generous gift by Mark and Pam Rubin. Pam and Mark, who will be celebrating their 53rd wedding anniversary this year, met on a blind date set up by mutual friends. Not wanting to “waste” a Saturday night on a date that could be a flop, Pam agreed to see Mark at a Sunday brunch at their friends home, where he was dropping by before rushing off to a reception. After meeting Pam, Mark never made it to the reception! It was a whirlwind romance and they married only eight months after that first meeting. They have three children and, now, four grandchildren. 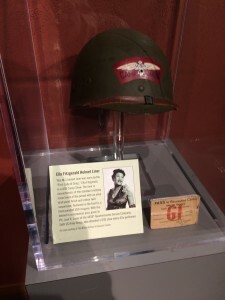 The Rubin’s first became involved with The National WWII Museum even before its inception at the celebration of Medal of Honor recipients held in Riverside, CA. 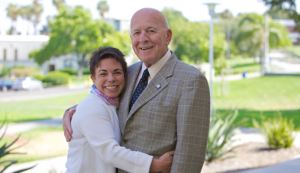 Pam and Mark were guest of the Ray Ohrbach, then Chancellor of the University of California Riverside. While at an event the next day, the Rubin’s met Museum founder Stephen Ambrose, who sparked their interest. The Rubin’s attended the Grand Opening of the US Freedom Pavilion: The Boeing Center in January 2013, where Mark was approached by trustees, Gov. Wilson and Ted Weggeland to become a trustee of the Museum. Mark gladly accepted. Later that year, the Rubin’s made an exceptional gift to sponsor the Liberation Theater to be featured in the monumental Liberation Pavilion that will begin construction next year. The Theater will be a specially-designed space, 1650 square feet, with seating to accommodate approximately 75 people. A commissioned film, presented in a looped format, will celebrate liberation and mourn the sacrifice and suffering of the soldiers and the Holocaust survivors. The film will show Museum visitors that the ultimate victory and liberation of thousands of people were worth fighting for and come away with the of hope for a peaceful future. The sponsorship of the Theater is near to the Rubin’s’ hearts, due to the fact that Mark is a Holocaust survivor. Born in Czechoslovakia, Mark spent his early childhood in hiding with his family. He states “we were like bounty, my mother, brother and me. My father was in a different hiding place…so not to all get captured at the same time.” The daughter of the family who was hiding the Rubin family turned them in to the Gestapo for a reward. His father was captured the day before. The family was sent first to Sered, a transit camp, after which Mark’s father was able to bribe the Nazi officer to have he family sent to Terezin or Terezenstadt (north of Prague) which at that time had become a “model” Red Cross camp. The German’s had invited to Red Cross to inspect this camp to prove that Jews were not systematically being murdered, but were just isolated from the general population. The family spent 4 days traveling across the country in a cattle car. Though Mark was only seven years old at the time, he says, “you become an adult very quickly.” While in the camp, he had no knowledge of what was happening in the war. In April, 1944 Terezin was liberated by the Russian forces after the fall of Berlin. When Terezin was liberated, 35,000 children had been there during the war — only 100 survived. Mark, his brother, and his two cousins were 4% of the child survivors. After liberation Mark and his family first settled in Bratislava, now the capital of Slovakia and then in Presov in the eastern part of Czechoslovakia. When it became apparent that Communism was threatening the livelihood of the Rubin family, they requested and received visas to come to the United States. They arrived on March 18, 1948 in New York. Pam believes that supporting The National WWII Museum is important, not only to preserve the American experience in the war, but because “if not for the second world war, [Mark and I] would never have met. This is our place…all the happenings of that time in history created the opportunity for us to meet.” Pam’s parents married in 1940 and, in order to avoid the draft, quickly had a child. Unfortunately, Pam’s father was still drafted soon after her birth, and was sent to England for the remainder of the war. He did return safely in late 1945. With their heartfelt and leadership support, Pam and Mark Rubin make sure that it does. We are grateful for their commitment to The National WWII Museum as it advances our journey along the Road to Victory. The Museum works tirelessly to preserve the stories of the WWII generation so that future generations will not lose the opportunity to hear and benefit from their significant experiences. Through studying this chapter of our past, we can become better, more responsible citizens of our communities, our nation, and the world. Every day, as we lose more of our living resources from the WWII era, so that the need to record, preserve, and share their stories becomes more urgent. 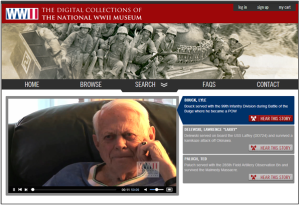 The Museum launched its Digital Collections Website in December 2013 (www.ww2online.org). The site currently contains segmented and annotated videos of oral histories from all military service branches, which are easily searchable by theater, branch of service, or keyword. Website visitors can also create personal accounts to which they can save photos and oral history clips – free of charge – allowing them to manage the resources to better facilitate their own research projects or personal interests. Currently there are 250 oral histories available on the website, covering a diverse range of WWII experiences. More than 75,000 people from around the world have already visited the website, many of which have used our resources for educational purposes. By the end of 2016, we anticipate serving 200,000 visitors to the site, including teachers, students, authors, researchers and family members of veterans represented in our collections. Digital access to the Museum’s vast collection of oral histories and artifacts is essential to bringing the lessons and values of World War II to individuals around the world who are not able to visit the Museum in person. The Museum’s Digital Collection has been made possible in part by a generous gift from The Hearst Foundations. 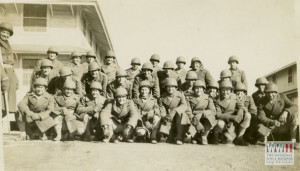 A large group of soldiers in winter coats and helmets pose for a photograph outside barracks at Camp Carson, Colorado. May 1944. Part of the Museum’s digital collection. The Hearst Foundations were founded by American newspaper publisher William Randolph Hearst in the 1940s to identify and fund outstanding nonprofits in the fields of culture, education, health, and social services. The Hearst Foundations seek to ensure that people of all backgrounds in the United States have the opportunity to build healthy, productive and inspiring lives. The Foundations have been a proud supporter of the National WWII Museum since 2002, contributing a very generous gift to the Museum’s Red Ball Express Education Program which brings WWII education and artifacts directly to the classroom. Director of Grants at The Hearst Foundations, Mason Granger, had been involved with the Museum before its opening in 2000. As President and General Manager of WDSU-TV in New Orleans for a number of years, he became well acquainted with Museum Founders Nick Mueller and Stephen Ambrose in the late 1990s. According to Granger, it was “hard not to be inspired by their enthusiasm and passion.” Granger noted that during his tenure at WDSU, it was the commitment of then General Sales Manager Frank Ratermann that helped lead Granger to feel the station should get involved. Granger states that Ratermann’s support for the Museum and dedication over the years were “tremendous and contagious.” After leaving New Orleans for New York in 2007, Granger began his career at The Hearst Foundations, where his enthusiasm for the Museum continues. According to Granger, the hallmark of The Hearst Foundations is to respond to the needs and priorities of institutions across the country. He believes that the Museum’s mission of honoring and preserving the history of the United States is exceedingly significant, and that The Hearst Foundations wanted to respond to the Museum’s vision and goal by aiding in the growth of the its digital archive. Granger states that the Foundation recognized the importance of the Museum being able to interact with the public on a broader technology level, so that the Museum’s priceless archives would be preserved and available beyond the physical institution. He went on to say that the Hearst Foundations’ engagement with the Museum is a unique opportunity, and that the efforts of President Nick Mueller in creating a relationship between the city of New Orleans and the rest of the world through such an important cause is worth celebrating. He believes that the Museum is playing an essential role in “preserving the heritage and legacy of individuals who were vital in saving the world. If we don’t preserve and protect their legacy then we lose a significant part of ourselves.” Granger concluded with the statement that The Hearst Foundations are proud to have the opportunity to honor these individuals through the digitization of the Museum’s collection. The Museum is proud that The Hearst Foundations have honored us with their ongoing trust and support. The National WWII Museum is privileged to have the support of The Hearst Foundations in our expansion of our digital archive as a preservation effort for the Museum’s incredible collection of artifacts, oral histories, photographs, videos, and much more. Visit the site to see more! 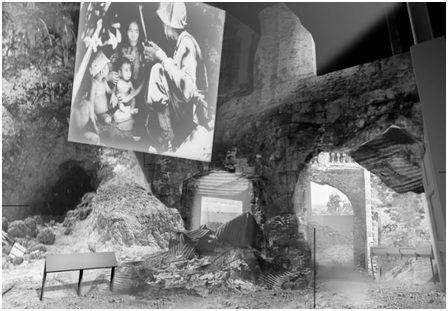 As we come to the end of the our journey on the Road to Tokyo, we take a look at the final two exhibits within the Downfall gallery, which will examine the last ghastly months of war and the controversial military decisions that led to ultimate allied victory. On August 6, 1945, the United States dropped an atomic bomb on Hiroshima, Japan. A second atomic bomb was dropped on Nagasaki on August 9. The unprecedented devastation these bombs caused brought the war to a sudden climax. 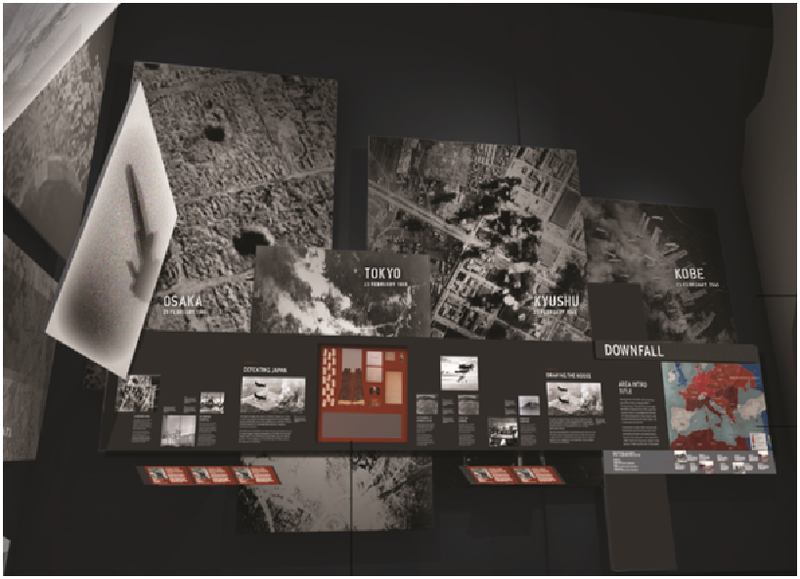 This exhibit will cover the immediate effects of the bombs as well as introduce visitors to the unending debate over the morality of using these new and terrifying weapons. Experiencing the horror caused by the atomic bombs and faced with the additional threat posed by the Soviet declaration of war on August 8, Emperor Hirohito conceded defeat. The Japanese government agreed to surrender under the terms of the Potsdam Declaration issued by Allies, and victory over Japan was secured aboard the USS Missouri in Tokyo Bay on September 2, 1945. This exhibit will cover these final events that brought World War II to a close. The Surrender exhibit has been made possible through a generous gift by the Ashner Family Evergreen Foundation in honor of John “Slew” McCain Sr., Admiral US Navy and John “Jack” McCain Jr., Admiral US Navy. 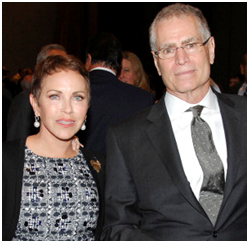 The Ashner Family Evergreen Foundation was founded 12 years ago by Museum Trustee Michael Ashner and his wife Susan to better coordinate their philanthropic efforts. Michael and Susan are both from South New Jersey. Michael grew up in Margate and Susan in Pleasantville. The Ashners have been involved with the Museum since 2011, when friends Ginny and former board member David Knott mentioned to them that there was The National WWII Museum in New Orleans. David shared stories of his involvement, and asked Michael if he too wanted to become involved with the Museum. Shortly after their discussion Michael took on a leadership role, joining David on the Board of Trustees. 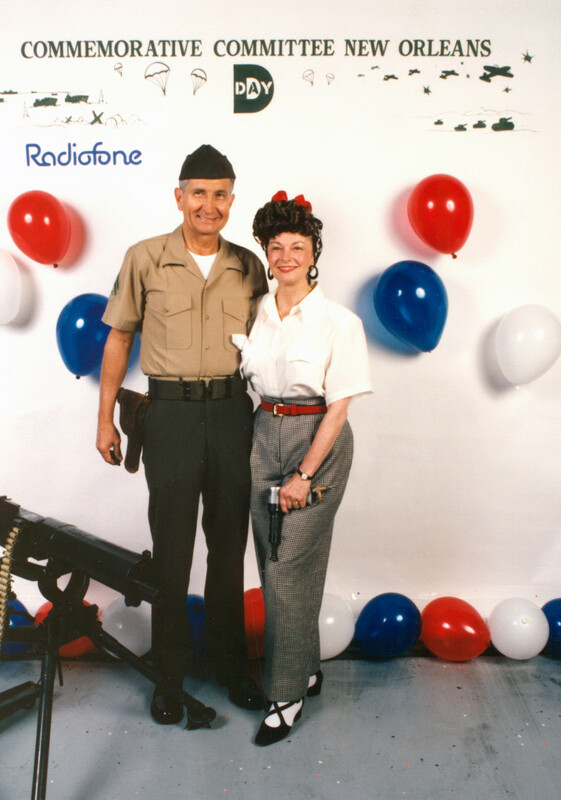 Michael and Susan’s decision to demonstrate personal support for the Museum was also influenced by their family connections to the war effort. Michael’s two uncles, Morton Hassman and Jules Rainess, both served during WWII. Morton was a glider pilot and was killed in Operation Varsity, a massive airborne assault near the end of the war that landed Allied forces across the Rhine. Jules was in the US Army and served in the difficult New Guinea campaigns. Fortunately, he survived his combat tour. Jules was reserved in discussing his wartime experiences. “He was a big man at six feet two inches tall,” Michael said. “When he enlisted he weighed 180 pounds. When he came back from New Guinea, he was down to 120 pounds.” Michael and Susan have named the Breaching the German Frontier Bunker gallery within the Road to Berlin in honor of the service and sacrifices of Michael’s uncles. The National WWII Museum is thankful for the support of Michael and Susan Ashner as we continue down our Road to Victory. As we continue down the Road to Tokyo, we stop next at our final immersive gallery space, Downfall, which will examine the final months of the war and the world-changing military decisions which led to Japan’s ultimate surrender. Unrestricted submarine warfare by the Allied forces were aimed to cut off Japan from shipping and trade while General Curtis LeMay’s low altitude bombing campaign incinerated Japan’s urban and industrial centers. With their economy destroyed, the Japanese could not produce the food and materials needed to carry on the war. The nation faced starvation. But the battles of Iwo Jima and Okinawa demonstrated that a fanatical will to resist animated the Japanese military and nation. The willingness to sacrifice and die for Emperor Hirohito allowed the Japanese military government to refuse to concede. Therefore, the United States planned the largest amphibious invasion in world history, Operation Downfall. But instead of this invasion, the United States dropped atomic bombs on Hiroshima and Nagasaki, bringing the most violent, bloody conflict in history to a dramatic climax. 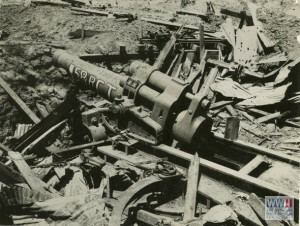 Stunned by this new weapon which could wipe out an entire city, and accompanied by a declaration of war against Japan by the Soviet Union, the Japanese government asked for a peace settlement which spared Hirohito. The U.S. granted it. Victory in Japan Day, also known as V-J Day, occurred August 15, 1945, and American troops entered Tokyo unopposed at the end of August. A formal surrender agreement signed aboard the USS Missouri on September 2, 1945 finally ended the hostilities of WWII. Exhibits within Downfall will include Drawing the Noose, Defeating Japan, Dropping the Bomb and Surrender. 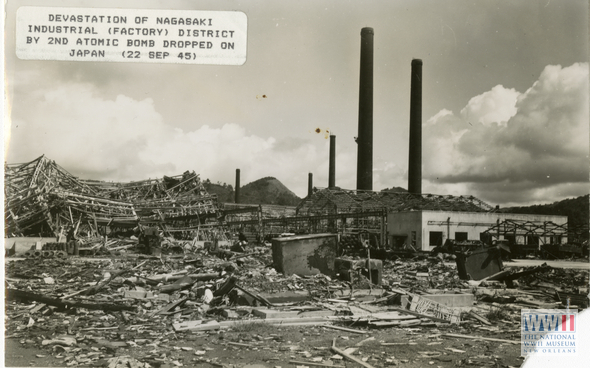 Devastation of Nagasaki industrial factory district by second atomic bomb dropped on Japanese on 22 September 1945. In an attempt to avoid a costly land invasion and force Japan to surrender, the Allies implemented a blockading strategy to prevent the Japanese from importing the vital natural resources they needed to continue the war. The Americans launched an aggressive submarine warfare campaign against Japanese merchant shipping and enforced a surface blockade. 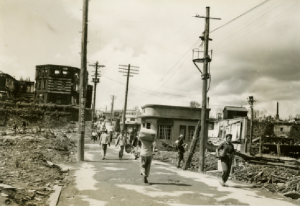 The exhibit will cover these naval tactics, as well as the firebombing campaign conducted by B-29 bombers which destroyed industrial operations and urban centers within Japan. Despite signs of their impending defeat, the Japanese military leadership vowed to continue fighting. operation and the defensive plan of the Japanese as they built up their resources on Kyushu and encouraged civilians to resist the invasion. Meanwhile, the atomic bomb was tested in New Mexico. The failure to force Japan to surrender through traditional bombing, and the heavy casualties predicted on both sides should the invasion occur, pushed American leaders to consider using this new weapon. The exhibit will detail the factors which informed the final decisions of the American leadership and cover the secret delivery of the atomic bombs to the Marianas Islands. The Defeating Japan exhibit has been made possible through a generous gift in honor of Lt. William Mosey, Navy Air Corp, Lt. Jack Heise, Air Force. As we continue down the Road to Tokyo, and through the Philippines gallery, our final stop is the Battle of Manila exhibit, which will detail one the bloodiest urban fighting scenes in the Pacific Theater. 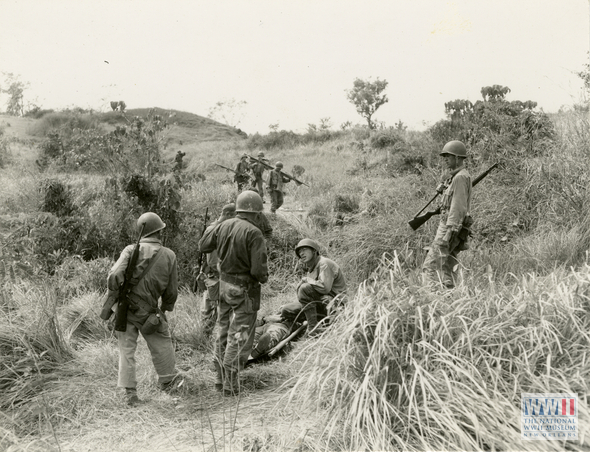 Aided by Filipino guerrillas, the Allied Forces savagely fought the Japanese for control of the capitol. 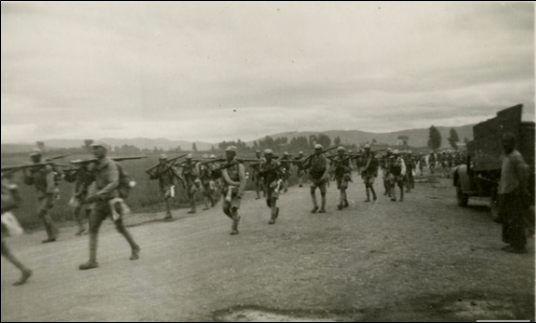 Rather than engage in house-to-house combat, the Allies relied on heavy artillery barrages to defeat the Japanese. This led to the complete destruction of Manila, once called the Pearl of the Orient, and resulted in the loss of more than 100,000 Filipino civilians. The fierce struggle to wrest the city from the Japanese ended with the Allies securing Manila in March 1945. The defeat in Manila, though catastrophic, brought the Allies one step closer to liberating the Philippines from Japan’s barbarous control. By projecting their power and escalating the level of violence, the Allies were able to push through the islands and continue on their way toward the Japanese mainland. The Battle of Manila exhibit has been made possible through a generous gift by Madlyn and Paul Hilliard. 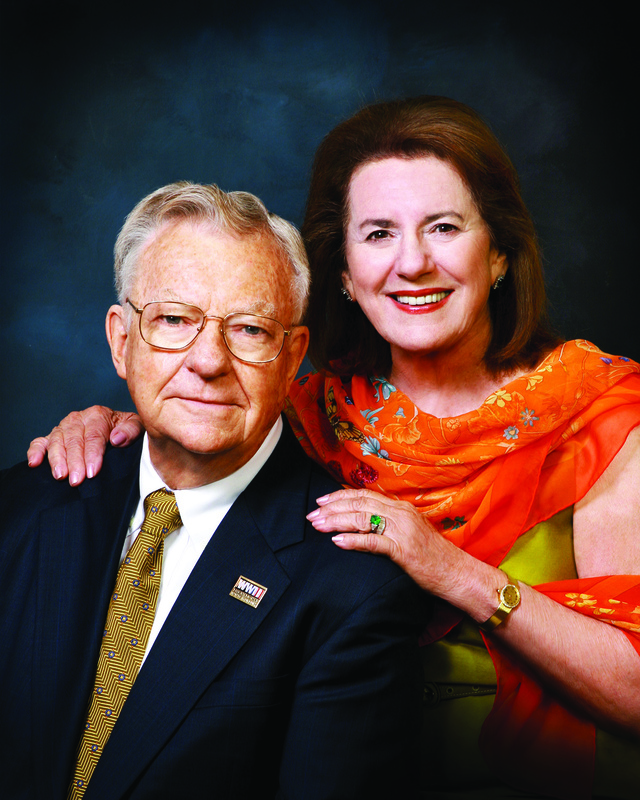 For more than a decade, Museum trustee and WWII veteran Paul Hilliard and his wife, Madlyn, have been two of the Museum’s most active advocates and supporters. They have provided transformative support for several Museum initiatives, including the capital expansion, acquisition and restoration of artifacts, collection of oral histories, and education programs. Paul is a Marine Corps veteran who served as a radioman/gunner in SBD “Dauntless” dive bombers in the Pacific. He turned 17 in June of 1942 and pleaded with his mother to authorize his enlistment in the Marines, finally, in February of 1943, she relented and Paul was shipped to boot camp in San Diego. After more than a year of training in aviation radio, radar and gunnery, he was sent to the Solomons for assignment to an SBD dive bomber squadron. As we continue down the Road to Tokyo, we stop next at the powerful Philippines gallery, which will cover the major events of the American campaign to retake the Philippine islands, offering a special opportunity for observing the build up and outcome of the biggest naval battle in World War II, Leyte Gulf. The Allies’ return to the Philippines resulted in the beginning of Japanese Kamikaze attacks as well as the immobility of a majority of Japanese naval vessels due to lack of oil supplies. The campaign represents both the Allies’ moral obligation to end Japanese imperialism in the Philippines as well as the Allies’ strategy for reaching mainland Japan. The Philippines gallery will include five major exhibits: America Returns, Destroying the Japanese Navy, From Leyte to Luzon, Battle of Manila and Leyte Gulf Theater. Computer interactive timelines will immerse and fascinate visitors as they map out events, and a computer interactive Dog Tag Experience kiosk will allow visitors to trace how the war affected a specific service member throughout his time in the Philippines. In addition, each exhibit will display unique interactive features and artifacts that will engage visitors in this remarkable story. The Philippines gallery has been made possible through a generous gift by The Charlie and Janette Kornman Charitable Fund. As we continue to travel down the Road to Tokyo and out of the Island Hopping gallery, visitors will stop next at the China-Burma-India gallery, which details the important campaign led by the Allies to prohibit the Japanese from further expanding their empire. The China-Burma-India gallery provides an overview of the campaign to halt Japan’s determined western advance within China, Burma, and India from 1937-1942. 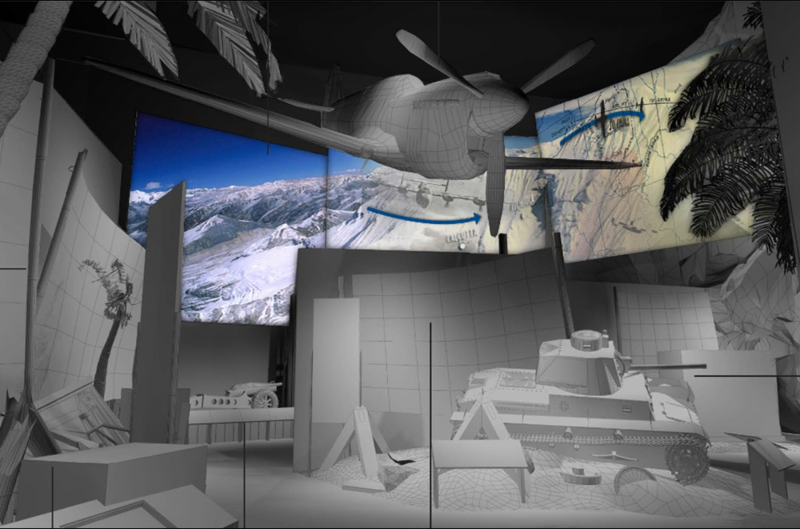 The gallery will explore the tactics used by the Allies to stop the Japanese from controlling these countries, including keeping China in the war, the important role of pilots and air power, as well as an overview of Special Forces operations, including those involving the Office of Strategic Services. The gallery will feature rare artifacts, exhibits and interactive elements. Exhibits will explore the collaboration between Chinese and American military leadership and present the major developments in the planning of air attacks in difficult environmental conditions. 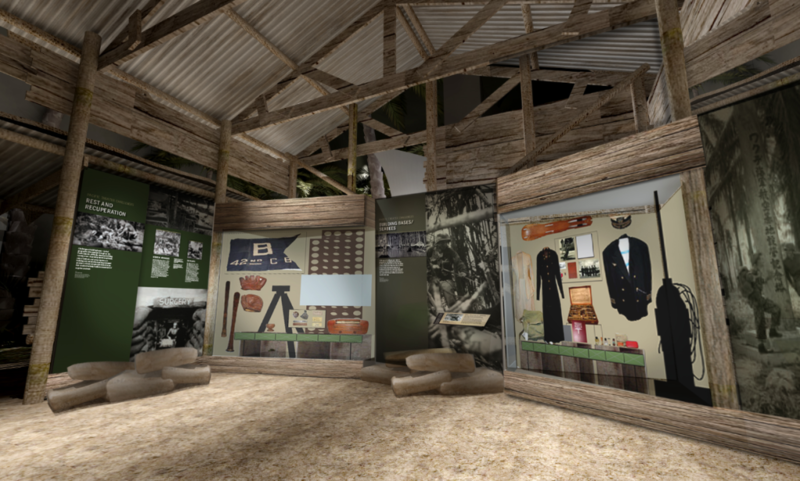 The gallery will feature four exhibits that will use immersive environments, rare artifacts, and interactive elements to captivate and educate visitors about this important, and often untold, story of the Pacific war. The exhibits include Strategic Importance of CBI, Logistics, Raiders and Covert Ops, and Flying Tigers/Air Power. This exhibit will provide an overview of Japan’s early advances in the CBI theater and the Allied campaign to limit further expansion. Events highlighted within the exhibit include discussion of the Chinese forces under General Stilwell fight in Burma, the retreat to India, the closure of Burma Road, and the Chinese army and guerrilla units’ five-year struggle against the Japanese in mainland China. The exhibit also highlights the importance of China’s role in the war. The majority of Japanese army strength was occupied in China, and American air power in China was a key strategy in 1942-43. The Strategic Importance of CBI has been made possible through a generous gift by the Brees Family in honor of Col. Eugene W. Brees II, US Army. The China-Burma-India gallery has been made possible through a generous gift by Joy and Boysie Bollinger. Twenty years after first becoming involved with The National WWII Museum, Boysie Bollinger remains tireless in his support. In his work on the Museum’s Board of Trustees, Bollinger has lobbied government officials, potential donors, friends, and anyone who will listen to support the Museum. On March 24, 2015, he and wife Joy led by example with their own donation to the Museum of $20 million. Ranking among the top donations in the country to a non-profit organization or museum, this is the largest private gift ever received by the Museum. The gift will be used to add an iconic architectural piece to the Museum’s six-acre New Orleans campus: the Canopy of Peace. 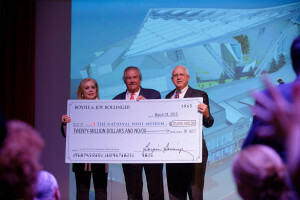 A portion of the historic donation will also go to the Museum’s endowment, a step Bollinger noted as significant to the institution’s future. 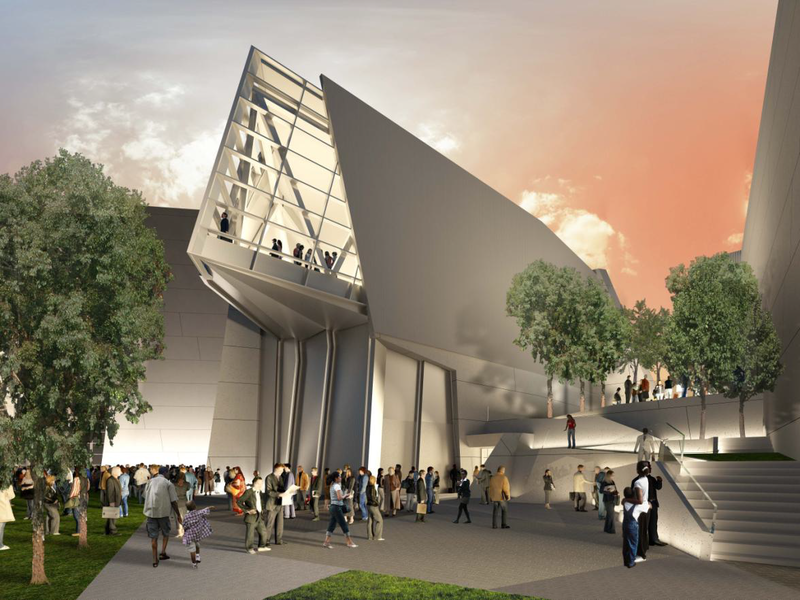 The endowment guarantees the Museum will always have a steady source of funds to support the growing campus. Bollinger, a key player in the Museum’s leadership through critical phases, has always understood the importance of expanding the institution’s campus and its reach, and his donation will guarantee the Museum can continue on this essential path. As we continue through the Road to Tokyo and into the Pacific Campaign Challenges gallery, we come to two immersive exhibits detailing the monumental obstacles American forces had to overcome for victory in the Pacific. 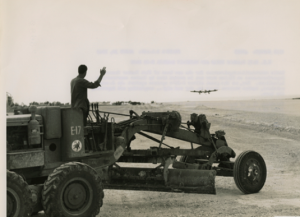 The vast geography and logistical challenges of the Pacific War led to the creation of hundreds of airfields, supply depots, ports, barracks and more by the Navy’s Construction Battalions (CB, or “SeaBees”) as well as other service engineers. Building Bases in the Pacific will explore the lives of these critical servicemen including the complexities of their work and the obstacles that they faced. Personal accounts will feature the difficulties of life in disease ridden and hostile environments, and the importance of building positive relationships with native island populations. Construction was vital for pushing toward mainland Japan, and this exhibit will discuss the various ways in which Navy SeaBees helped lead to Allied victory in the Pacific. This exhibit will explore difficulty of life in the Pacific, as well as the medical advances that were made in light of many hardships. American forces serving in the Pacific had little opportunity to escape the war. Escape was crucial for troops to mentally and physically recover from their service, though there was little that compared to the comforts of home. Some troops were allowed furloughs in Australia and New Zealand, but many were trapped in the tedium of remote island locations, never allowing them a break from their environments. An Alien World will feature various accounts and memoirs of these trying times of Pacific campaign service men and women. The Building Bases in the Pacific exhibit within Pacific Theater Challenges (Seabees) has been made possible through a generous gift by Jones Walker LLP. Bill Hines is the Managing Partner of Jones Walker and also serves on The National WWII Museum Board of Trustees. Jones Walker has been committed to and involved in the Museum’s growth since its inception. Many Jones Walker partners have personally supported the Museum both financially and through the development of its programs. Hines became actively involved as a member of the Board in 2007, and became a member of the Executive Committee in 2013. He currently chairs the Museum’s Audit Committee. The Museum is fortunate and grateful to have the support of Jones Walker, LLP in helping the Museum complete our Road to Victory Capital Campaign. As we continue our journey down the Road to Tokyo, and upon exiting the Guadalcanal gallery, visitors will come upon a rice hut, symbolizing the first Japanese structure captured by the Allies in the Pacific Theater. Here, visitors will have the opportunity to step back from battles for a moment to learn about the tremendous obstacles that American forces had to overcome in the Pacific. In the Pacific Campaign Challenges gallery, visitors will gain a deeper understanding of why this war was so difficult to win. The Pacific war presented extreme environmental conditions, isolation, and vast distances never before faced by the American military. 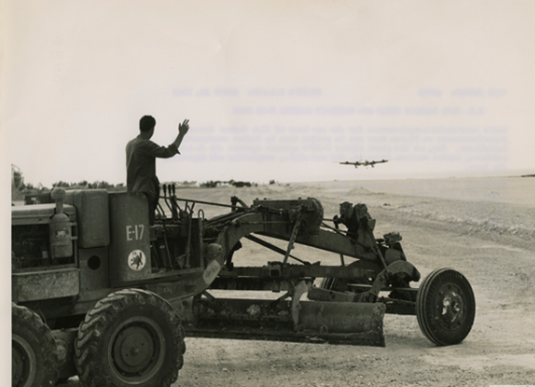 It took ingenuity and major engineering feats to build bases, airfields, and supply depots – all critical elements of a winning campaign. The harsh environment harbored flourishing tropical diseases that carried major physical and psychological impacts for US forces, threats that added to the uncompromising, kill-or-be-killed nature of the struggle against entrenched Japanese forces. Exhibits within this gallery include Building Bases in the Pacific (Seabees) and An Alien World. The future Pacific Campaign Challenges Gallery has been made possible through a generous gift from the Estate of Patrick F. Taylor. This presentation of an essential part of the war story is one of many ways that the generous philanthropy of Phyllis and Patrick Taylor has impacted the Museum. Phyllis and Patrick met when Phyllis was working at a hospitality booth at an oil show in Lafayette, Louisiana. Patrick was a guest of the company she was working for and was immediately smitten with Phyllis. He tricked her into going out with him by telling her that the man who was supposed to give her a ride home had been called off on a job and had asked Patrick to give her a ride home. The next day the two had lunch and that evening, Patrick announced to a friend that he had met the woman who would become his wife. Fourteen months later, Patrick and Phyllis were married. New Orleans became their home for the next 40 years. The couple first became involved with The National WWII Museum through their friendship with Museum founder Stephen E. Ambrose. Patrick and Stephen were part of a group that met regularly at the Taylor ranch in Mississippi to “solve the problems of the world.” Phyllis had a special interest in WWII history because she had several family members who served in the war, including her godfather, an aunt, and two uncles. Shortly after plans for The National D-Day Museum were put into place, the Museum learned of a Supermarine Spitfire that was to be auctioned off in London, and the Museum asked Patrick if he would act as its representative. Journalists in London were intrigued that two New Orleanians had arrived in London with intentions of purchasing the renowned fighter plane, and the next day The Times of London published an article about Patrick and Phyllis. The Museum provided the funds to back the winning bid for the plane, but needed additional funding to have the plane shipped to the United States and then fully restored. Patrick and Phyllis generously covered those costs, and the Spitfire still hangs in the Louisiana Memorial Pavilion today. Patrick was always a student of history. Phyllis shared that the two of them “were elated with the establishment of the Museum and overjoyed when it became The National WWII Museum” in 2004.